Triangle were awarded the contract for the BS 9251 residential fire sprinkler system and BS 9990 wet riser at Apex House, Wembley. This follows similar successful installations for Tide Construction including Grand Felda House, Karma House and Sherwood Court. 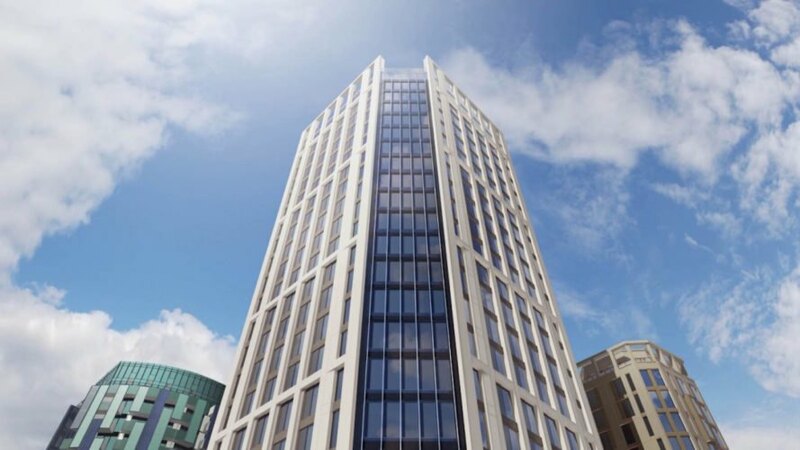 The 29 storey student accommodation scheme is being developed by Tide Construction and Vision Modular Systems in a fast track time of 12 months. The sprinkler system protects all bedrooms, living and kitchen area, cluster corridors, and basement gym. Our engineers have been working at the Vision Modular factory in Bedford where all the pods are manufactured and the furniture, windows, electrics and plumbing are all installed before being transported to site. Once on site, the module is connected to the power and water supply, our engineers will attend to site to complete a commissioning process to ensure the sprinkler system is fully operational. The last of the 679 modules has just been lowered in place ending a 13 week lift and fit procedure to reach the height of 90 meters, the building is now Europe’s tallest modular tower, and second tallest in the World. Modular Construction is set to become more popular following a government pledge to directly commission housing projects that use offsite construction through a £3bn fund in an attempt to promote innovation in the industry.